This past March, Common Pastures volunteer Andres F. Cibils worked with the Women’s Association of Tiby2 in Mali, West Africa, through Winrock International, to assess and provide technical training in sheep feeding methods using locally available ingredients for feed (such as rice straw, sorghum, millet, corn stalk, cereals and bran) to improve meat quality. Assess the Women Association small ruminant farming practices, available feeds, breeds, quantity and general condition. Inventory potential supplemental ingredients applicable as animal feed. Propose various animal feed formula or methods according to animal body score and grazing potential. Provide trainings on small ruminant nutrition, health, management, reproduction, young stock and marketing protocols. Develop a set of user friendly nutrition and feed guidelines and protocols to guide members and the PADER-TKT project facilitator. We used these discussions as an opportunity to teach techniques to determine age and to monitor weight gain and body condition changes. Participants later had the chance to do/see a hands on demonstration. These discussions were used as an opportunity to discuss internal parasites and the use of the FAMACHA scoring card. Hands-on demonstration of mucous membrane inspection was done at the market. We provided general guidelines regarding daily dry matter intake, proportion of roughage vs. legume hays and concentrates, tips on how to gradually include concentrate feeds in the diet, as well as a discussion on the relative benefits of commonly available forages we were able to see in hay/livestock feed markets in Bamako and Segou during this and previous assignments. The issue of using forage trees was also discussed. Participants indicated that they were familiar with and often used tree forages such as Ficus, Acacia albidaor balanzan (leaves and pods), and Pterocarpus. We spent some time discussing the importance of planning and keeping records. We stressed the need to stockpile feeds and store them adequately prior to the beginning of the fattening program as well as the need to regularly monitor results by assessing weights and BCS and the importance of using the FAMACHA method every two weeks to detect signs of anemia. 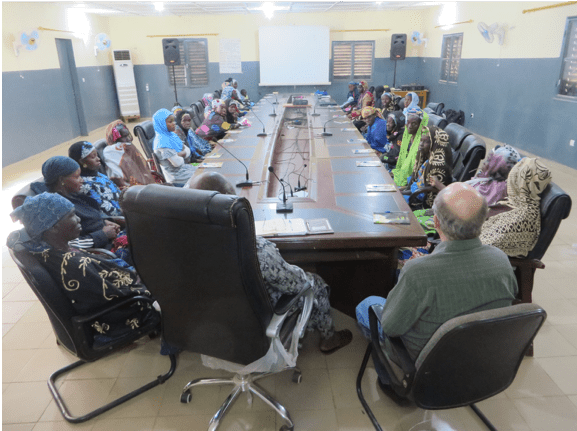 Despite conducting the training in a conference room at the ORS in Segou, Mr. Bourama Berthewas extremely helpful in making arrangements for the entire group to visit a small ruminant market in Segou. 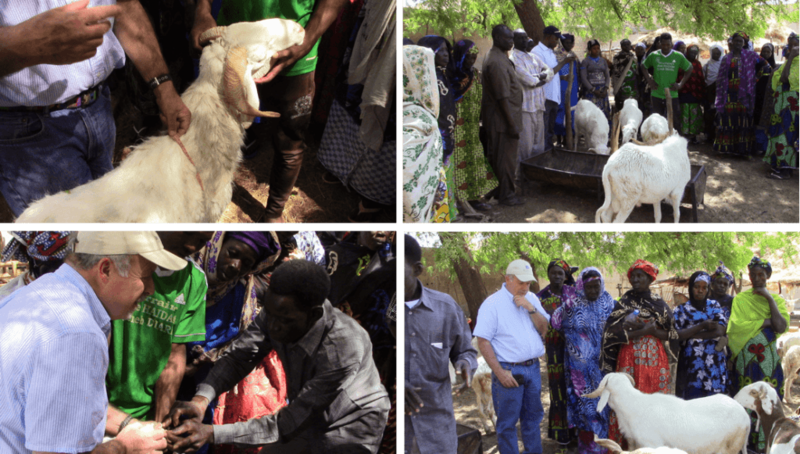 This provided us the opportunity to discuss criteria to select young rams for fattening including the most appropriate breeds (we were able to observe Bali Bali crosses, Sudanese crosses, and local breeds), age (we inspected a 1 year and 6 to 7 month old animal) and overall body condition. Participants were able to learn how to determine age by checking a ram’s permanent incisors, how to assess body condition score and weight (using the weight tape) and how to detect potential internal parasite problems by checking a ram’s eye mucous membrane for signs of anemia via the use of the FAMACHA score card. At the end of the training, Mr. Bourama Berthe received a laminated FAMACHA score card, a few weight tapes, and laminated guides for correct aging and body condition scoring. Participants appeared very interested in the training and actively took part in discussions. Women’s ages in our group ranged from senior members of the community to young mothers who attended with their newborn babies and/or toddlers. We received good questions and comments throughout the two day course.